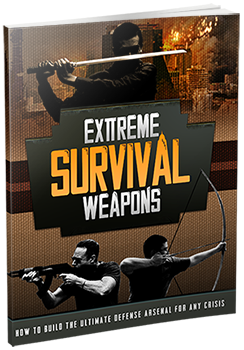 The "12 Level Arsenal": Tips, tricks & tactics to choose the best rifles, pistols, edged weapons (& more) every prepper will envy! The "5-second mini-rifle" - Although "illegal" for most people, I'll show you how to bypass local laws and carry this covert weapon legally on page 41. The "urban survival sword"! Don't laugh... I'm dead serious! And it will be YOUR #1 favorite weapon after you read page 29! How much ammo you should carry if you need to "bug-out" to a secondary safe location. I'll lay out the hard facts on page 53. This FREE Guide Will Be Sent To the Email Address You Submit Above!